Ferrofluids consist of ferromagnetic nanoparticles, which are of interest for audio devices, data storage, measurement technology and cancer therapy. The recently introduced imaging technology Magnetic Particle Imaging (MPI) utilizes these ferrofluids as a tracer for medical tomographic imaging. This technology utilizes alternating, strong magnetic fields and the non-linearity of the particle magnetization in these fields to acquire data for reconstruction. For image reconstruction a model of the particle magnetization is needed. Assuming that the particles used for imaging are single-domain and additionally feature an instantaneous reaction to the alternating fields, the Langevin function for paramagnetism is used today. However, the particle behavior observed in the measured data differs from the quasi-stationary model. Hence, we are interested in the magnetodynamics of single-domain particles driven by a strong AC field. Our approach of modeling the data includes the Brownian and Néel Relaxation process and the uniaxial shape-anisotropy and the cubic crystal-anisotropy of the used contrast agent. To address these dynamics, the stochastic differential Langevin equation is solved numerically. Left: Energy landscape of the crystal magnetic anisotropy of magnetite. 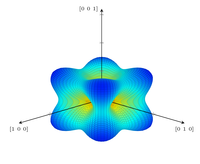 The crystal structure allows four different easy magnetization axes along the x=+-y=+-z axes. Right: Energy landscape of the shape anisotropy of a uniaxial ellipsoid. von Gladiss, A., Graeser, M., Ferguson, R. M., Khandhar, A. P., Kemp, S. J., Krishnan, K. M. and Buzug, T. M.: The Particle Response of Blended Nanoparticles in MPI, In: International Workshop on Magnetic Particle Imaging, 115, 2016.